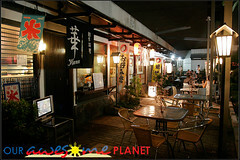 Tarafuku Set (P1,545). This came with 3 beef (tongue, beef meat and beef karubi which is beef ribs) , 2 pork (pork butabara w/c is belly and buta horumon w/c are intestines), 1 Wakami (seaweed) soup, choligi salad and a rice. The set is good for 2 person but you have to order one or two more rice to satiate your appetite. The rice really was great with the meat with its moist and plump grains. 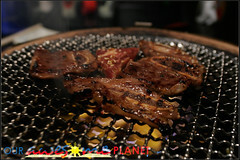 The marinated meat was superb with or without its yakiniku sauce (with chili paste and freshly chopped garlic). 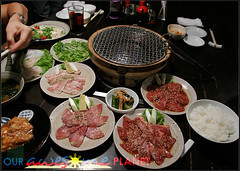 We were also tempted to try their Wagyu TokuToku Set but we decided not to…Too many meat for dinner. Yakiniku style of cooking the bite-sized meats. They change the griller top once in a while. Meat sauce we loved dipping our meat! 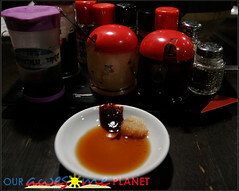 Their yakiniku sauce with chili paste (kujijang) and fresh garlic. What better way to order so many dishes is to meet up with friends! That’s what we did for this foodtripping of ours! We definitely enjoyed the food and the company. Nice to have met up with you Chris and Shar! Hana is where we got the dessert…neighboring restaurant inside Little tokyo that serves flavored ice shavings…we got the peach flavor (nothing to choose from since the bestseller chocolate with banana is already out of stock.). It didn’t taste right because for me, it tasted like Benadryl cherry flavored! It tasted better with the milk but still. Ewww…but Aidan finished it off! So much for an early sleeping time…. We’d love to go back to Uramesi Ya to check their other stuff but be sure that you bring extra clothing for you will smell after or just opt to go there at night where you’ll go home after. Parking is another issue when dinner time comes. No available parking fronting the restaurants. Either you park at Makati Cinema Square (MCS) or the parking sapce of the offices beside Little Tokyo along Pasong Tamo. You just have to give a tip to the guard. For lunch, I guess there’s only 1 option — MCS. Thanks to my HB’s new Japanese friend that has been giving tips on where and what to eat good and authentic Japanese dishes. Don;t you just lourv it? Looking forward to more great Japanese food. U485 2277 Don Chino Roces Ave. 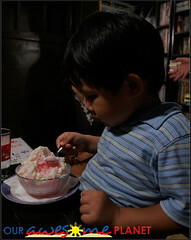 This entry was posted on Friday, October 31st, 2008 at 4:59 pm	and is filed under Outing, Food Trips. You can follow any responses to this entry through the RSS 2.0 feed. You can leave a response, or trackback from your own site. I just want to ask if they serve liqours (booze,sake, hard drinks) and how much. Its not mу first time to go to see this web site, i am visiting this web site daiⅼly and obtain pleasant factѕ from here everｙday.